Description: The top of the top. The Design by Roland Christen is perfect to any respect, optical, mecanical, coatings. 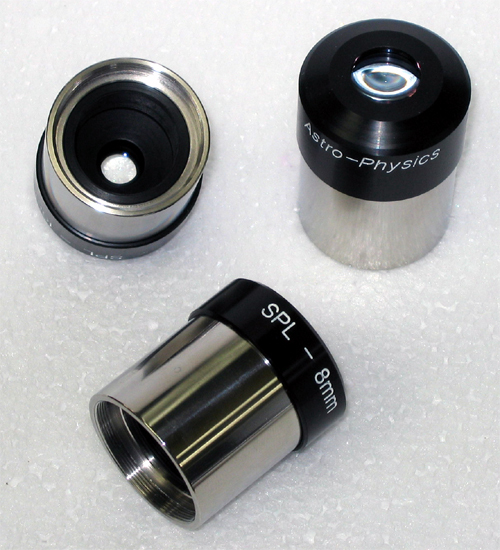 The SPL Series are the best planetary eyepieces available to market today. Eye placement is excellent any easy, field stop and eye relief are well balanced, even with eyeglasses. Images are very sharp to the edges, no false color, no astigmatism, no kidney beam effect, no internal reflexion. The optics are a cemented Monocentric lens triplet which lets only two contact surfaces between air and glass for maximum transmission. Unbeatable for light transmission, contrast and sharpness, the field of view is narrow for those nagler used people, but large enough for any planetary lover and professional users.